Tuesday night Jeff managed to convince me to ditch out on my work and get out for a quick ski in the morning. Since we both had stuff to do we settled on one of the many short north facing couloirs dropping into Stevens Gulch from the ridgeline between Mt. Edwards and Grays Peak. The strips of snow dropping off the summit of Mt. Edwards to the north provide longer lines, but are not set nearly as far into the rock. Jeff's awesome pictures from the line can be seen on his SmugMug. A quick sled through the basin brought us to the bottom of the line. Coming up above timberline brought the amazing views of Grizzly Gulch, along with the haze and smell of smoke from the wildfires burning in the southwest. Combined with the morning light, the smoke produced beautiful colors in the basin, but, as I realized when I got home, had a surprisingly large effect on the clarity of my pictures. As we started the hike, we immediately saw the amazing tracks left the previous day by Brennan Metzler and Andy Dimmen on the East Face of Torreys, and by Andrew Oakley down the Dead Dog. After hiking about 10 minutes I made the genius decision to see how well my helmet would slide back down to our starting point which it did wonderfully. The climb went quite quickly, starting out around 35 degrees then staying right around 43 degrees for the length of the coulouir. When I reached the top I was stoked to look south into the Peru creek drainage, although not intense, the SE face of Grays looks like one of those lines where you could 1500' of vertical in about 10 turns, I can't wait to ski that some day. 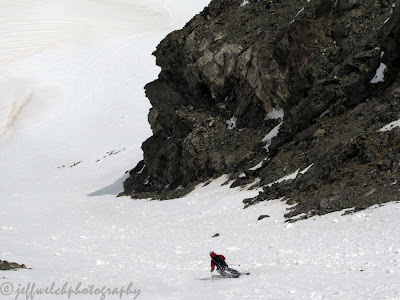 Dropping in, the first 2 turns were bulletproof, but they were followed by the smoothest 1000 vertical feet of corn I have ever skied in a couloir, absolutely no evidence of past moving snow or rockfall to taint the snow surface. 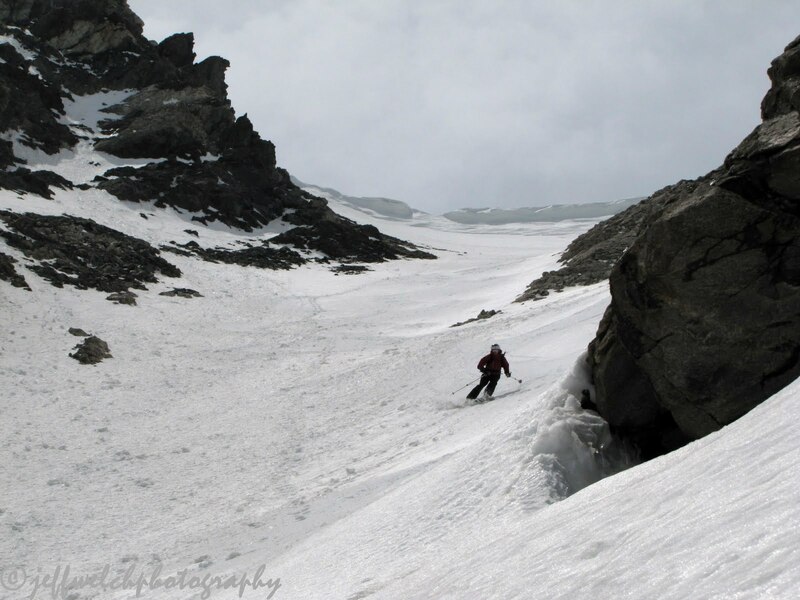 As it opened up at the bottom we were able to make big, fast turns through the rolling terrain back into the basin. Its interesting to see the dust from the previous storm, as it can in with a wind event that brought little or no precipitation, the dust has collected in low points on the snow surface where it is protected from the wind. Such as in the small drainage channels that can be seen in the picture of Jeff above. Overall, a great, quick mission: A fun climb, good snow, and a great partner in crime.